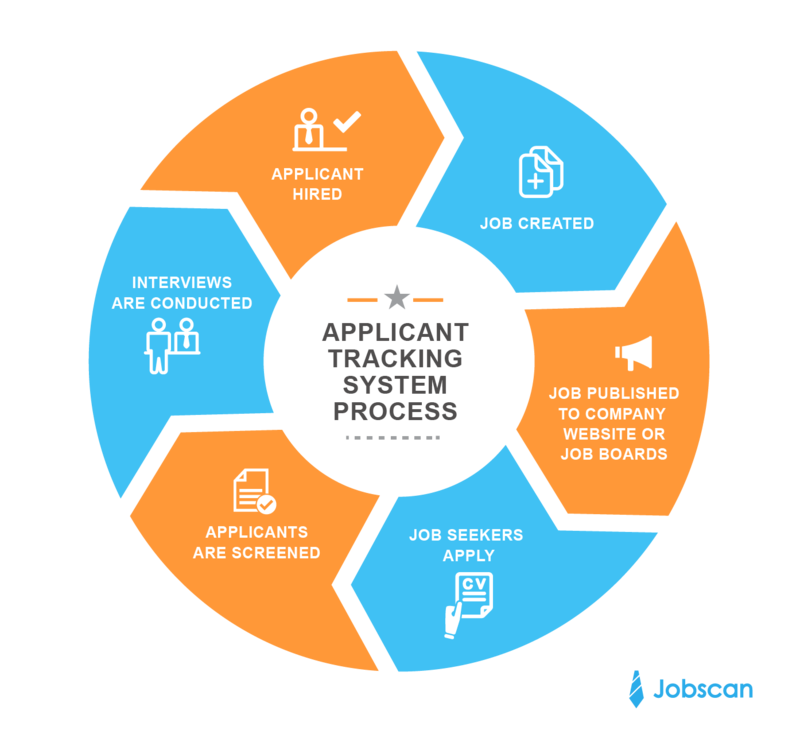 Applicant tracking systems (ATS) are a type of software that act as a human resources database for organizing applicants. If you are familiar with customer relationship management tools (CRM), ATS are a close comparison, but with a particular focus on their search functionality. ATS are used by all sizes of companies to sift through large groups of job applicants, and to organize and contact those applicants. The main goal of ATS are to act as a tool designed to simplify the life of the hiring manager or recruiter. Just like a search engine, after a recruiter's search, some applicant tracking systems rank applicants by keywords (skills, job positions) and filters (i.e. location and education). So, as an applicant, you should be optimizing your resume specifically to fit the job you are applying for. To learn more about resume optimization check out Jobscan’s homepage with the resume optimization tool. Applicant tracking systems are designed to search resumes the same way a recruiter or hiring manager would. They are meant to take some of the workload off of the recruiter, so they try to mimic the human process. When a recruiter or hiring manager receives a stack of resumes (or an inbox full), he or she won’t likely have the time to read each one thoroughly. So, they can search for keywords related to the position they are looking to fill. ATS makes the searching much easier and automated to save time and avoid any oversights or human error. Applicant tracking systems are used to help ease the workload of recruiters and hiring managers. The internet makes it fast and easy for job seekers to apply for jobs. In fact, job board sites like Monster and Indeed allow job seekers to apply for a job using a saved resume with only one click. Another key reason Applicant Tracking Systems are used is because of the law. The Internet Applicant rule was set in place to provide better recordkeeping of employees. The EEOC requires all companies with 100 or more employees to submit an EEO-1 report each September. The EEO-1 tracks employee race and gender information. ATS make the process of tracking information much easier. Applying for jobs has become very easy for you, the job seeker, but daunting for the recruiter or hiring manager. Last year, Inc. reported that on average, a corporate job posting receives 250 applications. Of those 250 applicants, 4 to 6 will be contacted for an interview. The hiring manager/recruiter cannot possibly make the time to search through them all. ATS are the solution to their problem. While applicant tracking systems are not perfect, they are a good way for recruiters to hone in on top candidates. ATS can also organize and save resumes for later. It is not only a filtering database, but a great organizational tool for hiring. Hiring managers can send emails directly to applicants to either inform them that they didn’t make the cut, or ask for an interview. Even if an application wasn’t the right fit for a certain position, recruiters and hiring managers can go back into the system later and pull up their application for a different position. If you’ve ever been contacted months later by a company you applied to, ATS is probably behind it. ATS stores applications even after the job has been filled. Each applicant tracking system is slightly different. One might focus on the best possible keyword search capability, while another excels in resume parsing. Regardless of each ATS’s strengths and weaknesses, they all follow the same basic process. If you’re looking for specific tips on a particular job posting, you can now add the url in your Jobscan match report and we’ll return specific tips based on the company’s applicant tracking system. When you apply through an ATS, you will most likely be asked to answer what are called “knockout questions”. Knockout questions can be in the style of check boxes or short answer, and their purpose is to narrow the pool of applicants immediately. If any of the knockout questions are answered unsatisfactorily, the resume will be flagged as rejected by the ATS. If you answer the knockout questions correctly, your resume will make it through to the next stage. 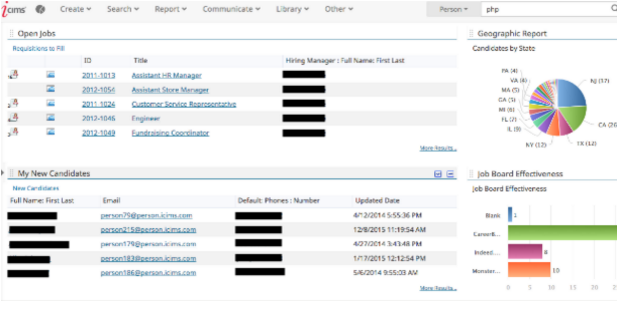 Recruiters/hiring managers can then search the resumes stored in the ATS by using keywords. These keywords are typically the exact same keywords used in the job posting. They could be based on skills, experiences, location, former employers or work experience. The image below shows a candidate search window from the perspective of the hiring manager/recruiter. Because ATS store resumes, it is possible that you will be contacted for another position with the same company later on. If the keywords the recruiter/hiring manager uses to search for a different available position match with your resume, it is likely you could receive an interview. Recruiters and hiring managers can also make notes or star-rate about each candidate. If they have no negative feedback on their profile, they might be contacted later on. Believe it or not, your social media profile can actually help your job search. Some ATS can use social media to search for potential employees. 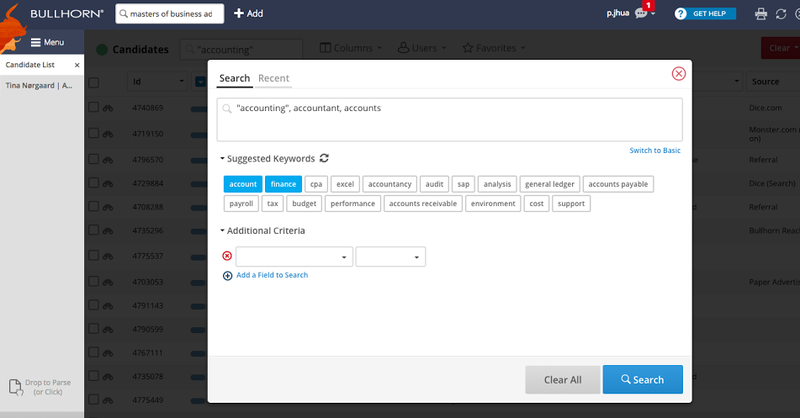 Certain ATS software searches through social media sites for keywords. So, update your profiles with common keywords for the job industry you are interested in, as well as your work experience, and you might just be contacted about a great job. Applicant tracking systems are built to ease the job of the recruiter or hiring manager by narrowing the pool of applicants. So, you can’t expect any basic and generic resume to make it through. From knockout questions to keyword searches, there are plenty of opportunities for your resume to be rejected or lost in the shuffle. The fact is, you will not get an interview if your resume is not optimized against ATS. ATS are not perfect. There are many good candidates whose resumes the recruiter/hiring manager might never see because they don’t include the correct keywords. However, ATS is great resource overall because it helps solve the problem of sorting through tons of resumes. As a job seeker, you should get to know everything about ATS, and construct your resume based on the job posting for which you are applying. How you format your resume is also important factor for applicant tracking systems as they can be outdated or incorrect when parsing certain resume formats. Tailoring a well formatted resume to applicant tracking systems and to the job you hope to get will raise your chances of getting an interview. Keywords are easily the most important part of getting through ATS. Think of a keyword search in an ATS as a search engine, like Google. For example, if you want to find out when the 4th of July fireworks show is taking place, you might type into the Google search bar, “Fireworks”. Based on the keywords you typed in, the top search results matching both “fireworks” will appear. Many ATS use a Boolean search capability, which allows the searcher (hiring manager/recruiter) to combine search terms using AND, NOT and OR. For example, you will get more exact information about the fireworks show if you type in “Fireworks AND Chicago”. Similarly, if a hiring manager/recruiter types into the ATS keyword search bar, “Java AND New York City”, candidates whose resume mentions “Java” as a skill, as well as their location in New York City, will jump to the top of the applicant list. Some ATS will rank candidates higher if a keyword is mentioned more than once. For example, a resume that lists “Java” two or three times throughout will rank higher on the list than one that only mentions it once. It can benefit you to list keywords more than once for this reason, but you should be careful not to take part in keyword stuffing. An example of keywords stuffing is if you were to add in your resume, “Buffalo buffalo buffalo buffalo buffalo buffalo.” and change the text to white to hide it. Sure, it will be recognized as a complete sentence, but the hiring manager/recruiter will also see it as a lazy technique to get yourself to the top of the ATS list. Furthermore, some ATS highlight keywords in yellow, so it could be highlighted even if it is hidden. Creating a “Skills” section on your resume is a great way to include relevant keywords in a natural way. Keywords that hiring managers and recruiters will search for are generally skills, location and work experience. When including skills, think hard skills vs. soft skills. Hard skills are concrete, such as “Spanish fluency”, “financial analysis”, and “Python”. Soft skills are important to the employer too, but they are better proved in person than on your resume. Soft skills include, “hard working”, “team player”, and “positive attitude”. Customizing the keywords in your resume based on the job posting is very important. Read the job posting carefully and notice which keywords are relevant to the position and how often they repeat. If you have skills or experience that match those keywords, include them in your resume. If you need a curated list of keywords to include per application, run your resume through Jobscan’s resume optimization tool to receive a match report with important terms to include in order to boost your likelihood of getting past ATS filters. The challenge with customizing your resume is determining which information is necessary, and which information can be omitted. The best way to customize your resume is to use a tool that scans your resume and the job posting and recommends to you the keywords you need to get through ATS. Jobscan is one such tool that you can use for free and see real resume optimization results. Below you can test a sample resume and job description or input your own. There are thousands of applicant tracking systems available, but some are much more reputable than others. If you are looking for an ATS to use for your business, you’ll want to consider functionality as well as your budget. Resume Parsing: Extract and organize the parts of each resume into structured information. Resume Storage: Once entered into the ATS, resumes remain in the system as possible candidates for future positions. Keyword Search: Recruiters/hiring managers can search by any keyword, and often with the Boolean search method. Boolean search connects keywords using AND, OR, NOT and NEAR. Filters: Filters can include the job seeker’s location, the source of your application, the age of your profile (how long ago you applied to the company), and whether or not you are a referral. Automated Email Customization: Companies can customize rejection and other emails to ensure that applicants get a response to their application. If you are looking for an ATS for your company, do your research to find out which features will be best for you. The market size of Applicant Tracking System companies is reportedly in the 350 range, though many of them have only a few hundred clients. The potential for market growth is huge since the need for organization of employee information is becoming a necessity for companies big and small since the Internet Applicant Rule was set in place. This is a list of the top applicant tracking systems. Started in 1996, and acquired by Oracle Companies in 2012. One of the leading ATS Softwares with over 20 million users. Taleo focuses on talent acquisition. Founded in 2000 with a focus on creating a cloud-based recruiting software. iCIMS is one of the leaders in ATS and has over 3,000 clients. Owned by IBM since 2012, but Kenexa planted its roots back in the late 80s. It has been focused on recruitment since 2005. Very user friendly for the applicant and hiring manager. Great for first time ATS users. Maybe a bit too user friendly at times--hiring managers complain of too many clicks to get from start to finish of each candidate. Jobvite began in 2006, so it is fairly new for having so much success. This software boasts 1,600 clients and a database of 43 million job seekers all over the world. Greenhouse was founded in 2012 and has grown very quickly. A few of its major clients include Airbnb, Buzzfeed, Disqus and DigitalOcean. Costly, but many users say it is worth it for the product. Founded by Art Papas as a marketplace for business applications. They are located in Boston, Massachusetts and currently have over 10,000 clients and 300,000 users. 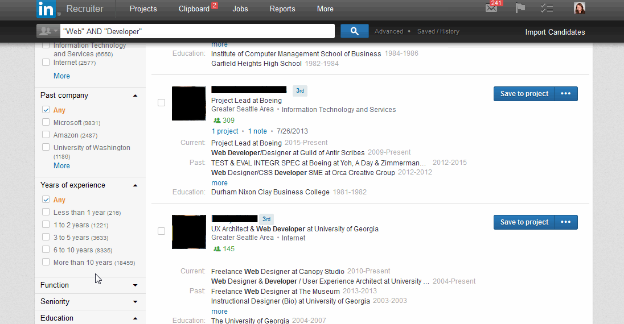 Born from its namesake cult networking resource, Linkedin Recruit gives access to its pool of 400 million professionals. Plus, it features 20+ filter options. Founded in 2001, but now has over 6,000 customers and over 32 million users from 60 different job industries. It is available in 32 different languages. Is time consuming for the hiring manager to customize, and for the job seeker to complete. Founded in 2005 and is geared toward attracting the customers of top ATS Taleo and SAP. It has a healthy combination of mid-size companies and Fortune 500 businesses. Akken Staffing is a private company founded in 2005. It has more than 10,000 users around the world. Applicant Pro focuses on making the customization of your company’s career site easy and functional. Positive reviews from hiring managers/recruiters. Job seekers have complaints about crowded pages. Founded in 2012, Lever has an advisory board with some pretty impressive names, including Marissa Mayer of Yahoo! and Jeremy Stoppelman of Yelp. Lever has over 700 clients including Netflix, Yelp, Lyft and Quora. ApplicantStack comes highly recommended by customers; even more so than the bigger name guys. It puts a major focus on resume parsing and optimizing the online job postings process. SaaS-based (software as a service), Big Biller put its focus and efforts on the recruiter. Its goal is to have an ATS up and running in a moment’s notice. BrightMove is designed by staffing experts, and is determined to keep its ATS up to date with the changing workforce. Maintenance and updates are its main goal. Founded in 2012, Crelate Talent hopes to bring a personal level to applicant tracking. The focus is to maintain a software that mimics the traditional process of sorting resumes as done by a recruiter/hiring manager. OpenCATS is a work in progress, but it is highly rated among free ATS. They are dedicated to making updates based on customer suggestions, but the funds make the process a little bit slow. Founded in 2005, iKrut is a privately owned company based out of the United Kingdom. Its goal is to require very little training to be able to use. Softgarden, based in Germany, uses an SaaS platform to bring together 10 years of HR experience and research into its ATS. JobScore hopes to simplify the networked recruiting process for the next generation of recruiters and hiring managers. It was founded in 2004 in California. More than 1500 small and mid-size companies use Recruiterbox to perform their basic ATS needs. It was founded in 2010. BambooHR is great for medium and small businesses because it is easy to use and affordable. Plus, you can get a free 7-Day Trial. Offering a free trial period, Zoho Recruit helps hiring managers and recruiters utilize job boards and social media to find the best candidates for job openings. Qandidate was recently founded, in 2013, and is based in the Netherlands. It features cloud technology and a very easy-to-use system. Founded in 2010, SmartRecruiters hopes to provide a well-built, affordable ATS option to small and mid-sized companies. Managing external recruiters is challenging, but good for internal management.